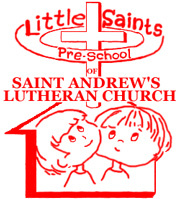 The Little Saints’ Preschool is a program of St. Andrew’s Lutheran Church. It is open to people of all faiths or of no faith. We do not teach Lutheran doctrine, but we do practice and teach Christian beliefs about the love of God and our responsibility to care for each other and the world that God gave to us. We offer half day programs for 2, 3 and 4-year-olds through morning and afternoon sessions. Our 2-year-old separation classes meet for 2-hours each day on Mondays, Tuesdays, Thursdays and Fridays with options for 2, 3 or 4-day classes. Our 3-year-old classes meet for 3 hours each day Monday through Friday with options for 4 or 5-day sessions. Our 4-year-old classes meet for 3-hours each day Monday through Friday with options for 4 or 5-day sessions. Our “Together We Grow” classes meet for 1 ½ hours each day and are designed for children ages 16 months to 30 months who are not quite ready for a separation program. A parent or caregiver stays with the child for these sessions. During the summer, we offer a 5-week camp for 3, 4 and 5-year-olds. These sessions last for 2½ hours on Tuesday, Wednesday and Thursday. Please call (516) 483-6540 for current tuition rates and registration fee.